As a leading commercial roofing company, we serve Columbus, Dayton, and Cincinnati with a wide range of commercial roofing services. We serve all industries with reliable and high-quality commercial roof repair services and installation as well as maintenance and inspections. Learn more about choosing the right commercial roofing contractors and how we can help protect your building against leaks, water damage, hail, and more. You have a lot of options when it comes to choosing a commercial roofing company. Still, it pays to do your homework when narrowing down your list of options. Our experienced and licensed commercial roofing contractors have decades of experience installing and repairing all types of common commercial roofs from TPO and PVC to EPDM and metal. We recommend taking the following steps to ensure you receive quality commercial roof installation that offers longevity and value to your building. While we strive to offer competitive pricing on all of our commercial roofing services, it’s important to remember that price isn’t everything. As they say, you get what you pay for, and this is certainly true with roofing. Make sure you understand what you are paying for and what’s included in the price. Commercial flat roof replacement and repair is very different than residential shingles. Experience matters when choosing commercial roofing contractors in Ohio. Experienced roofers will understand the specific needs of your building, be better able to detect problems, know which commercial roof repair methods offer long-lasting results, and know how to deal local weather conditions. Choosing licensed and insured commercial roofing contractors protects your business from liability issues. This also ensures the work will be done correctly and to code. Your commercial roofing company should be able to submit proof of financial responsibility that includes workers’ comp, bonding, and insurance. Our commercial roof contractors install and repair all types of commercial roofs. The right type of roof for your facility will depend on your budget, the existing roof on your building, the unique needs of your facility, and your goals. TPO single ply roofing makes up 40% of the commercial roofing market in Ohio for many reasons. It offers many of the benefits of EPDM and PVC roofing with a lower cost. This type of single ply roof is made up of a single layer of rubber, propylene, and ethylene with fiberglass. TPO roofs offer great resistance to impact, puncture, and tears. The membrane can even resist damage to UV and chemical exposure. 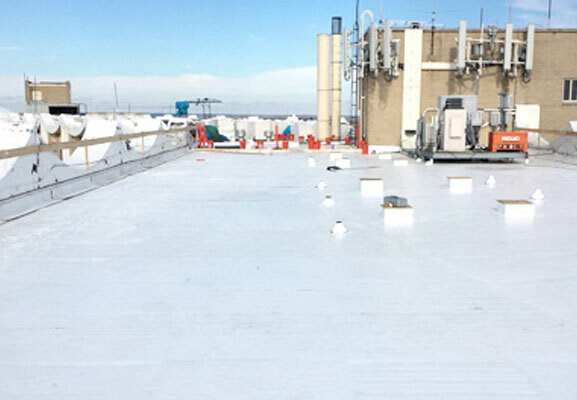 Our commercial roofing contractors install TPO roofs with hot air-welded seams for extreme seam resistance and leak protection. EPDM or rubber roofing is extremely popular for commercial buildings in Ohio. This type of commercial roof has been used for more than 40 years with excellent resistance to abrasion, wind, UV exposure, and rain with a low lifecycle cost. EPDM costs more than TPO and PVC roofing but it’s much easier to repair or modify for a longer life and fewer maintenance costs. EPDM roofs can last 30-40 years with regular care. PVC single ply roofing is one of the most popular options for commercial roof replacement. This single ply system is made from thick yet flexible thermoplastic material with great fire protection. PVC roofing won’t absorb oil and grease, making it a popular choice for restaurants and hotels. There are drawbacks to a PVC system, however. The material can become brittle in extreme winter temperatures and it doesn’t offer superior resistance to rain and snow. A traditional built-up roof is installed with layers of fabric and hot tar before it’s finished with gravel. This popular commercial roof system has a long track record and has been used for over a century. Each ply sheet in a BUR roof is reinforced with fiberglass for strength and durability. A built-up roof offers excellent strength, waterproofing, and UV protection with fairly low maintenance costs. Keep in mind a BUR system will have a higher installation cost than a single-ply system as this type of commercial roof installation is very labor-intensive. If it’s time to consider commercial flat roof replacement, a metal roof is an excellent option. While metal costs more upfront than other materials, it also offers the longest lifespan and the least amount of maintenance. 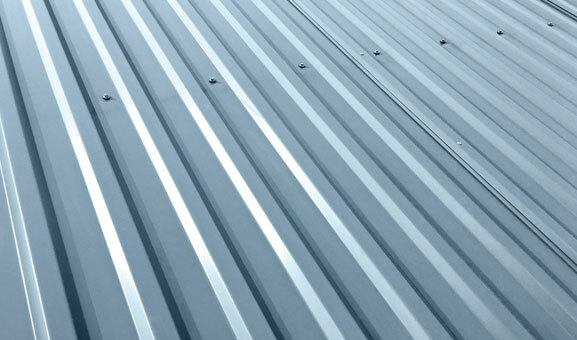 Metal roofing is very attractive and energy efficient. It’s the best possible defense against UV damage, leaks, and roof repairs. It can also reduce downtime at your facility during installation. When metal roofing does require repairs, fixing the roof is typically straightforward and may involve a liquid applied system to add many more years to the roof’s life. Commercial flat roof replacement is a major investment. The cost to replace your existing commercial roof will depend on many factors such as the type of roof you install and the square footage of your roof. A replacement roof can cost anywhere from $3.50 to $12 per square foot. There are several reasons flat roofs are so common on commercial properties. Flat roofs are easier to maintain than pitched roofs and they cost less to install due to less surface area and reduced labor costs. They also allow you to efficiently use exterior and interior space. Flat roofs are easy to access and walk on compared to a pitched roof for easier and less costly maintenance. This makes it easier to detect leaks and other issues on the roof, an important factor considering commercial roofs require more frequent inspections than residential roofs. How do I choose the right type of commercial roofing? Our commercial roofing contractors are experts in all types of commercial roofs. We will help you understand your options, review the needs of your facility, and choose an appropriate roof system based on your budget, needs, and energy costs.